We hear it all the time from our EcoXpert partners … there is a lot of talk about the convergence of Information Technology (IT) and Operational Technology (OT), and how the Internet of Things (IoT) will reshape our world: industrial processes are increasingly becoming automated and digitized, while electrical networks are becoming decentralized. Security is seemingly at odds with our need for remote intelligence and control, while efficiency remains a priority. The technology to support this convergence of IT and OT is available, and there are countless success stories of companies that have harnessed it to improve their bottom line. Yet, not enough is being said about the human relationships required to successfully implement changes that span organizational departments, differing geographies and ultimately impact various stakeholder groups. Developing efficient solutions, that often combine new technology with legacy infrastructure, requires highly-skilled people working within a network of integration companies that have each demonstrated their expertise in a particular aspect of a connected facility. Industrial facilities represent a massive opportunity for engaging this human element of IT and OT convergence. 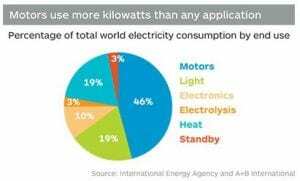 Consider motors: as demonstrated in this paper authored by the International Energy Agency, electric motors now account for around half of all the electricity consumed in industry, and they are increasingly reliant on automated control. This means that in addition to an intelligent control network that delivers operational efficiency, an intelligent power distribution network must be connected to deliver on the promise of energy and cost efficiency, along with overall facility up-time. Facility managers must involve partners they can trust to effectively integrate their systems, and to develop solutions that span the operational layers across all of their infrastructure. Integration companies that historically have developed their niche expertise in a particular market or area of focus must now either develop new skills within their ranks, or develop partnerships of their own. For example, technology provider Schneider Electric has a long history of partnering with system integrators, but more than ever, is seeing the need to connect these integrators with each other so they can develop the relationships they require either across town, or around the world. One way Schneider Electric achieves this is through its globally-renowned EcoXpert™ Partner Program. The program is made up of highly-respected technology providers who are trained and certified by Schneider Electric’s own experts in fields such as building automation, power management, data connectivity and light & room control solutions. This global program has allowed the customers of Schneider’s EcoXperts –all over the world – to optimize operations, including the convergence of IT and OT and successfully embrace IoT. Although industry analysts dispute the figures, IEEE stands by the fact that somewhere between 20B and 50B connected devices are supposed to hit our world by 2020. That’s an enormous consideration in how digitization will drive our future. However, technology alone cannot resolve the challenges and opportunities brought by IoT. A strong network of partners working together to develop solutions will develop unique insights into the systems that must interact in the connected world of the tomorrow. How are you tackling the challenges of IT and OT convergence, and what challenges do you see in deploying technology that spans different systems across a connected facility? I welcome your feedback below.